I've been learning how to write and read Roman Numerals larger than 20 simply because my five year old decided that he wanted to learn Roman Numerals this summer. Of course, he had Roman Numerals mastered right away due to his hypernumeracy, but we still did a variety of activities to reinforce his (and perhaps my own?) knowledge of the concept. 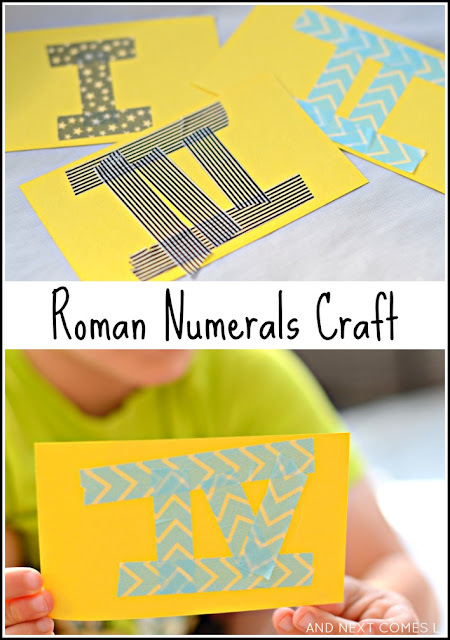 So we combined math and art to create this fine motor Roman Numerals flashcards craft. It was also a great cooperative craft for my two boys to work on together. And bonus, it encouraged turn taking, which I will explain how shortly. I made the first card to show the boys what we would be making. When J saw the card, he instantly lit up! He was so excited to make some cards of his own. He quickly declared that he would make II and instructed his three year old brother K to work on III. As you can see, cutting, peeling, and placing the washi tape on the cards are great ways to work on fine motor skills. The boys continued to take turns, alternating the Roman Numerals that they were creating, all the way up to 20. I'm sure that if the cards were bigger (to allow for more tape to fit) that J would have gone all the way up to 100 or higher. After all, it was a package of 100 index cards so it only made sense to make them all into Roman Numeral flashcards. These simple homemade flashcards would be cute to hang in J's bedroom, but, instead, we will be using them for a variety of other math activities in the future, such as this clock activity. Yeah, I don't think hypernumeracy is diagnosed that often, especially since most kids with hyperlexia are really good with numbers as well.